The Global Poker Index (GPI) Player of the Year (POY) race has been an exciting development this year. When it all started back in January, it was Jonathan Duhamel who blazed into the lead with an astonishing showing at the PokerStars Caribbean Adventure (PCA) in the sun-soaked Bahamas. The Canadian, former World Series of Poker (WSOP) main event champion, secured over $1.1 million in earnings. A final table at the European Poker Tour (EPT) Deauville followed, before he won the 2012 LA Poker Classic for another six-figure sum. By this time, it was only March, and everybody was starting to think that the POY might be over before it had even started. Then came the rise of ‘Mad’ Marvin Rettenmaier. The London-based German pro is one of the true grinders on the live circuit, playing anywhere and everywhere. Rettenmaier finally tabled the World Poker Tour (WPT) High-Roller in Vienna, secured 3rd spot in a €10,000 at EPT Berlin, won a €2,000 side-event at the EPT Grand Final in Monte Carlo, before making history when winning back-to-back WPT Main Event titles at the Bellagio and in Cyprus. If you thought the performance of Duhamel and Rettenmaier was something, have a look at Dan Smith. 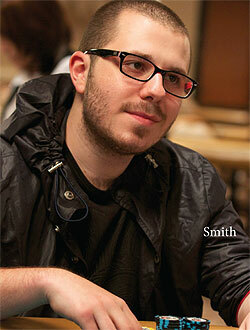 Smith also started the season well, with a $1,041,828 victory in the $100,000 Challenge at the Aussie Millions. He then followed up with three back-to-back $5,000 side-event victories at the EPT Grand Final in Monte Carlo. A 3rd place finish in a $5,000 WSOP event followed, before he took down the €50,000 High-Roller at EPT Barcelona for another seven-figure score. Smith currently leads Rettenmaier, with Duhamel sitting in 3rd place. A new look and a new competition is what's happening at InterCasino. They are celebrating their newer, more modern look by offering many prizes to new players - see their website for details as they change regularly. Get a 100% bonus up to $500.00 on your 1st deposit. Simply Click on a letter below to be taken to a list of online casinos that all offer video poker play.